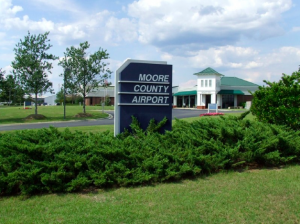 The Moore County Airport is the flying gateway to the golf capital of the world. The airport is located just five miles northeast of Pinehurst and since 1928 has seen golf-loving presidents, royalty, celebrities and aviation heroes park on our ramp. Of course, many golfers come to the area to visit the hallowed grounds of Pinehurst #2, the site of three U.S. Open golf tournaments including Payne Stewart’s famous victory in 1999. But savvy visitors know about the 45 other golf courses in the area, such as the famous Pine Needles track designed by Donald Ross and Jack Nicklaus’ Legacy golf course. Other attractions include a vibrant equestrian community, a symphony, a busy community college, superior shopping choices, a wide array of great restaurants and the lively spirit of small-town America. With nineteen hotels within the four villages of the Sandhills, finding a place to stay is never a problem. In support of our community, the airport is a vibrant facility with excellent waiting rooms, large hangars and an active EAA chapter. The airport also sponsors numerous aviation-related events such as “Young Eagle” days, a regional fly-in often supported by the US military from neighboring Fort Bragg, and even a Halloween airplane “haunting.” With a convenient location, long runways and precision approaches to low minimums, most GA and corporate flights find this an excellent alternative to the more expensive and distant services available from Raleigh, Fayetteville or Charlotte. Check out our reviews on AirNav, ForeFlight and AOPA web sites.